On Wednesday, January 15, 2014, I drove from Toms River, NJ to Philadelphia, PA to Girard Vet Clinic to pick up 2 adult males, Charlie (formerly named Meeky) and Mario who had been neutered early afternoon. Charlie is a dumbo ear solid tan and Mario is standard ear solid charcoal grey. I volunteered to do the post op care for AJ Ravinsky (rescue) and Kate Borus, the boys' new mom. The 2 hour car ride returning home was uneventful with both rats resting quietly in the carrier. At about 8:00 PM, they were settled in a one level cage. Then the grooming started and trouble followed. The two boys were non-stop cleaning themselves including the surgical area. I used a straw to distract them with puffs of air, which worked briefly. The boys would bend and groom their feet and sneak some licks to the incisions. This continued for about an hour until 9:00 PM which was time for their dose of metacam. I offered plain Reddi Whip on a spoon as a test to see if the boys liked it before adding the medicine. They each gobbled it up. Then I put the metacam into a fresh dollop of whipped cream and they both took their medicine. (photo below) I was hoping that the metacam would calm down Mario and he would STOP bothering his incision. It was too late. I noticed blood coming from Mario's scrotum. He had removed some stitches during the minutes when I went to get the metacam. I grabbed a white paper towel and applied gentle pressure to stop the bleeding. When the bleeding stopped, I put Mario back in the cage. As he moved around, the bleeding started up again as part of the scrotum was open with one big flap of skin showing. About this time Annette called for an update. She then contacted Lindsay Pulman, who kindly advised we had to bandage Mario's body to prevent him from bending and reaching the scrotum. It took us three tries to get the bandage just right on Mario. (see photo) Then, we bandaged Charlie, as a precaution. In the fourth photo below you can see some of Mario's insides coming out of his scrotum. 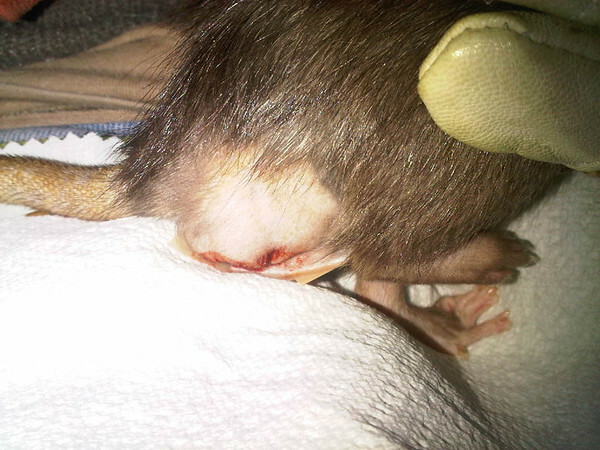 We flushed the open incision with Vetericyn Wound and Infection Care spray. Then we put a band-aid gently on his scrotum, with the non-stick part over the incisions and the sticky part up both sides towards his tail. (photo 5) During the night I kept adding more and more small strips of thin adhesive tape to keep the band-aid in place. The stress of wrapping and bandaging drained a lot of Mario's energy and he finally started resting. He laid in the crook of my arm for two hours. Earlier, I separated Charlie and Mario as Charlie wanted to "clean up" Mario's "bloody boo-boo." I was counting down to 8:00 AM Thursday when my local vet opened. At about 3:30 the bandage slipped off Mario's scrotum. Because he was resting quietly I left him be. At about 4:30 AM, Mario moved around and to my relief his scrotum was holding together. Before going to the local vet, I brought Mario and Charlie to Kate so we could decide together what to do next. Kate examined Mario's scrotum and determined "he is okay"..... WOW! Apparently the band-aid put enough gentle pressure on the area to slip the exposed tissue back inside. Also in the morning, looking under a bright light with a magnifier....Kate could see that there was one stitch still in place. Fast action and the body bandage saved Mario's life.